SKU: PNJ06. Categories: Party & Event, Miscellaneous Party, Concession Equipment. Tags: concession equipment, ice cream maker, soft serve. Fill included bucket to mixing line with cool tap water (2 gallons of water). Add entire bag of powdered mix to the water. Stir with a wire whip until completely dissolved (1 or 2 minutes). Pour the mixture into the soft serve machine to MAX LINE ONLY! Cover and put remaining mix in the refrigerator. All of the switches on the side of the machine should be in the up position once mix has been poured into the bowl. Once the mix is frozen, the black button to the right of the dispenser can be pressed to speed up the auger for quicker serving for 15 seconds at a time. The temperature setting below all the switches should be set at “10” for ideal texture. The soft serve machine must always be transported and kept upright. If placed on it’s side or upside down, damage will occur to the refrigeration unit. The first batch will take approximately 1 1/2 hours to freeze completely. Every batch thereafter will take approximately 1/2 hour if mix is pre-chilled in the refrigerator. Plug the soft serve machine directly in to a 110 volt AC circuit with 3 prong plugs. Do not use any extension cords!!! Do not have soft serve machine in hot or confined areas since this will either slow down or not allow the slush process to occur. The mix should only be filled to the designated lines. Do not run the machine without liquid product in the machine. When finished, shut the machine off and pull the plug from the outlet. Pour warm water in to the tub and drain through the spigot. Repeat this process until the tub is well rinsed. Do not take the machine apart or attempt to clean. We take care of that for you! This steamer will hold 40 to 45 hot dogs and 30 to 35 buns. This is a commercial level snow cone machine which will shave up to 500 pounds of ice per hour to keep everyone cool and refreshed on those hot days! Snow cone machines are great for pool parties, birthday parties, fund raisers, school carnivals, and much more! This machine comes with the main machine, a scoop, a cup holder, and a drip tray. 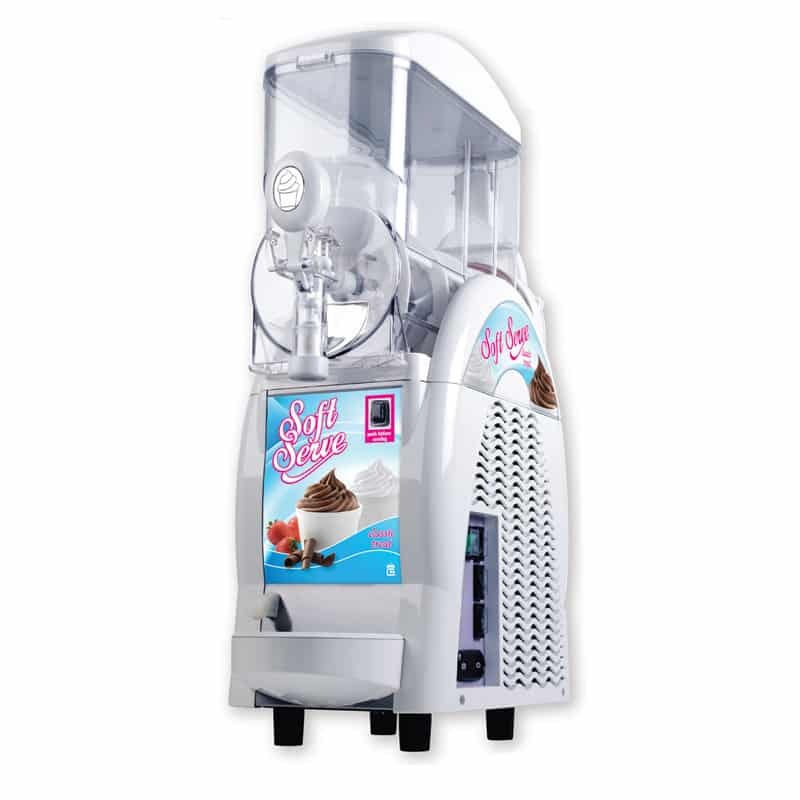 We carry all of the supplies needed for this machine which are sold separately.